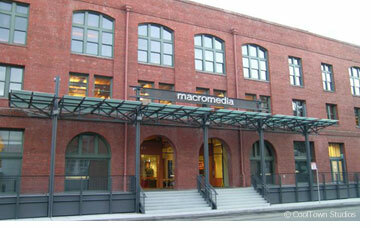 Where do Macromedia’s 600 employees work? Not in a suburban office park coupled with traffic congesstion. Not in an economically struggling city downtown. They happen to work in what is the fastest growing, increasingly popular area (Mission Bay) of one of the most desired cities in the country, San Francisco. Granted, word is that the transformed warehouse could have been a lot cooler rather than its cubicle-driven layout… and there could be more nearby dining options than are currently available, but that’s all coming as the former industrial district evolves into what will become the largest new knowledge-oriented village in the country. Still, its a couple blocks from the main rail commuter station, and just a few blocks from the heart of the city itself, which makes for a rich menu of post-work destinations. Why did Macromedia locate in the downtown when so many companies are still locating in office parks? Because it’s a digital economy company that’s entirely dependent on the most creative, innovative employees to survive, and they know where to find them.